A Celebration of Food & Wine! By now you may have guessed I’m a big lover of wine. I’m also a big lover of food. Oh yes, as anyone at work can attest to… I love to cook and I love to eat. Sometimes I love to do both at once, eat while I’m cooking – while enjoying a glass of wine, of course. And except for a waistline a little bigger than I would like, life is good – Life is very good. So let’s have dinner together. Blue cheese, but I use fresh parmesan a fair bit… it’s your choice of cheese. Balsamic Vinegar (I get mine from the same place I get my Olive Oil and use flavored balsamic like Maple or Cinnamon and Pear. Normally, salad is wine killer. 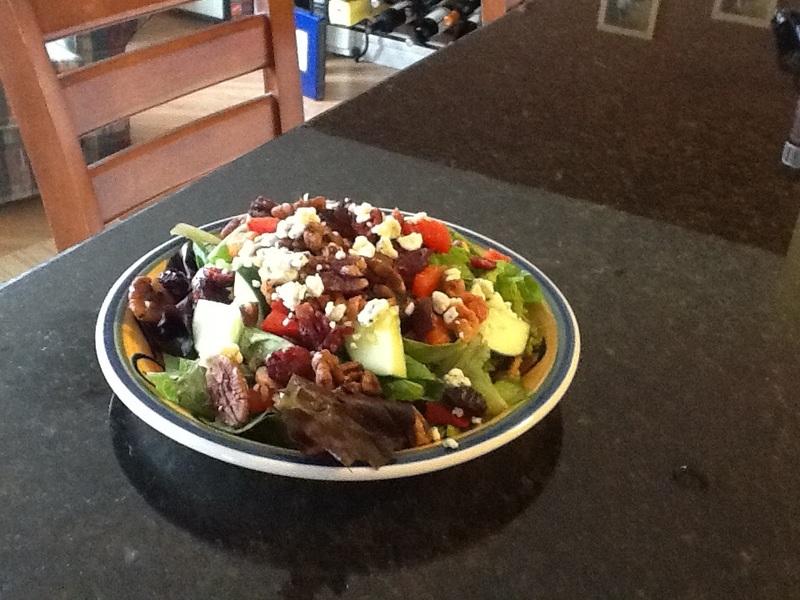 There aren’t many wines that go with salad, especially if you use an Olive Oil and Balsamic vinegar base. But crisp white wines with good acidity will make all the difference in the world. A crisp acidic wine like Sauvignon Blanc. A Riesling also works, but if you don’t like the sweetness of a Riesling try one of the many fantastic Sauvignon Blanc wines out there. Here’s a few of mine. These three are all from the Marlborough region in New Zealand, famous for Sauvignon Blanc and Pinot Noir. But our local Liquor store carries 120 different Sauvignon Blanc wines and there are great ones from France, Australia, California and Canada. Want to impress people with a dish that is so easy you’ll be a bit embarrassed? Caprese chicken. Buy those super thin chicken breast, chicken breast cutlets, and cook. As the picture is above, I do mine a lot on the grill. However, to keep your grill clean, go to the dollar store and buy those aluminum foil baking pans. Mozzarella cheese is melted on this, and could cause quite a mess on the grill. Cook the chicken , and in the final stages, put mozzarella cheese on top, and a slice of tomato. Let cook. (you can grill the tomato as well, and then lay it on top) When you remove it from the grill, drizzle balsamic vinegar over the top. I know… you’re looking for the rest of the recipe. That’s it… simple… serve with rice or potato side and your favorite vegetable, and your guests will love it and you’ll look super handy in the kitchen. Matching wines! Name your favorite wine, and chances are it will go with this dish. I’ve served this with Chardonnay, Pinot Noir, Pinot Grigio, Merlot just to name a few. And here are some of my favorites. 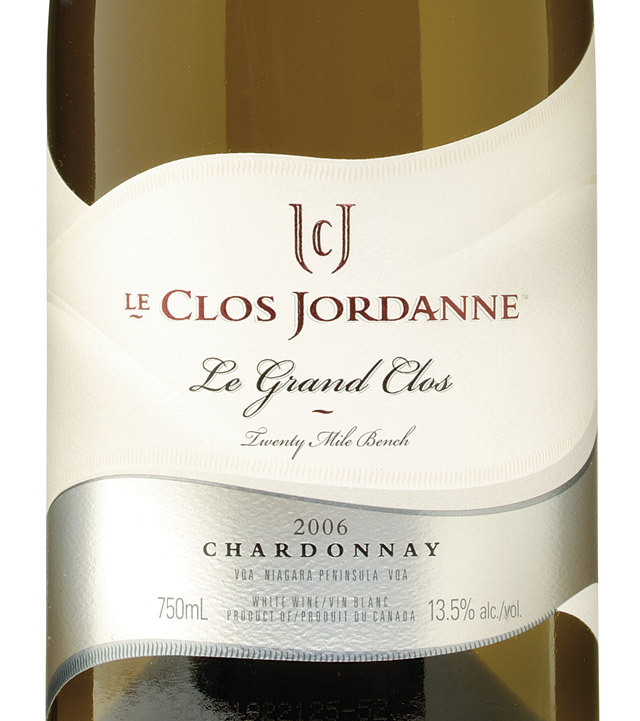 Le Clos Jordanne Le Grand Clos Chardonnay is my all time favorite. And yes, it’s a treat wine. For more information about this wine, click here. Here are some more of my favorites that are all under $20. The first one is Dreaming Tree Chardonnay, and Dave Matthews the musician is one of the owners. Great wine. 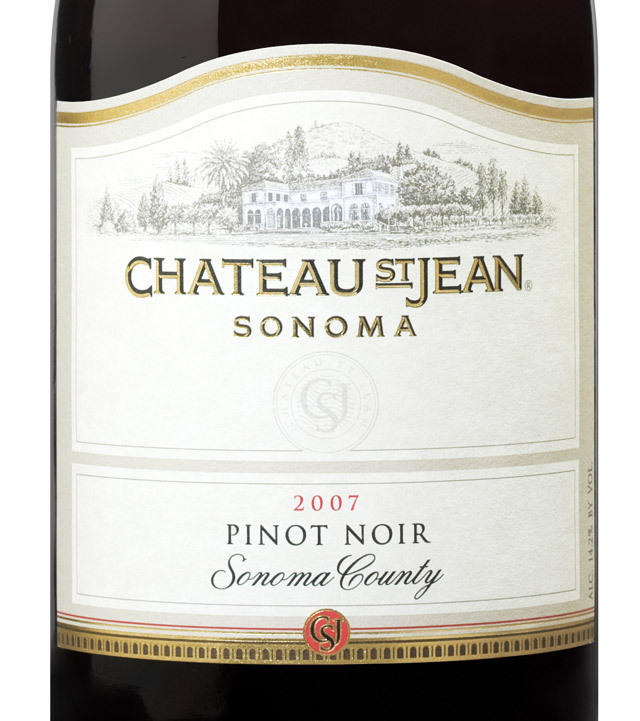 Then there is Chateau St. Jean Pinot Noir from California, which will go with any chicken dish you can serve. And finally The Velvet Devil Merlot from Washington State. The name says it all. Desserts – ensure what’s in the glass is sweeter than what’s on the plate. Here are a few excellent dessert wines. The first two are from right here in Nova Scotia, the first one is Blomidon Ice Wine, rich textured and refreshing. The second one is Benjamin Bridge, and if you haven’t tried it yet, their Nova 7 is fantastic. This ice wine is another fantastic wine from winemakers Jean-Benoit Deslauriers and Peter J. Gamble, it’s Borealis. And the third is another Canadian great – Inniskillen Ice Wine. Wine – My Fall Favorites! Autumn is my favorite time of the year. I love the cool crisp feel and the gorgeous colors. I believe I fell in love with Autumn growing up on the West Coast of Newfoundland. 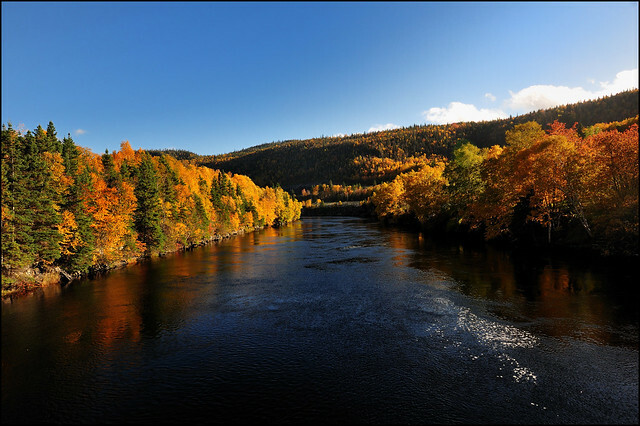 The pictures above are of my hometown, Corner Brook, Newfoundland. A small town surrounded by trees and water and it is gorgeous in the Fall. It’s also time for comfort food, and sitting in front of a fireplace with a great glass of wine on a cool evening. Ahhh,,, comfort food. Pizza, pasta, macaroni and cheese, meatloaf, pot roast, and turkey… just to name a few. We all have our own version of what comfort food is. And one thing I know for certain, there is a wine out there for you! Here is one of the best deals in the Liquor store today – In My Opinion. At $15.99 a bottle, this is a gorgeous wine. It is predominantly Merlot, which gives it all its plump juicy fruit flavors, with some Syrah (Shiraz) and Cabernet Franc for structure and body. This is the Marilyn Munroe of full-bodied wines. Dada means a favorite subject or obsessive idea….And, wine is one my favorite subjects, and some might say a little obsessed. Maybe that’s why I like this wine so much. Or could be all those smoky plum flavors that come alive in your mouth with a hint of oak that does not over-power the wine. Yeah, that’s it. Also, this wine is made and bottled with no Sulphur Dioxide, no sulphites. Hmmm, no headache? And it will go with most of your favorite comfort foods, mac and cheese, pizza, pork chops and is big enough to handle beef as well. Comfort food is just that… comfortable. It nourishes our soul, and we start to feel good and let go of anything that resembles a bad day. 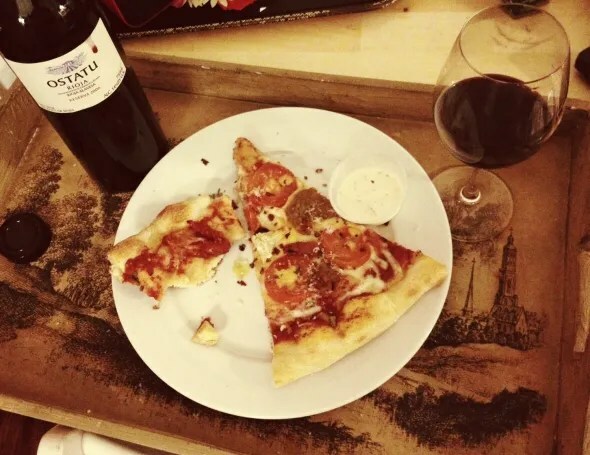 Wine that goes with comfort food should do the same thing. 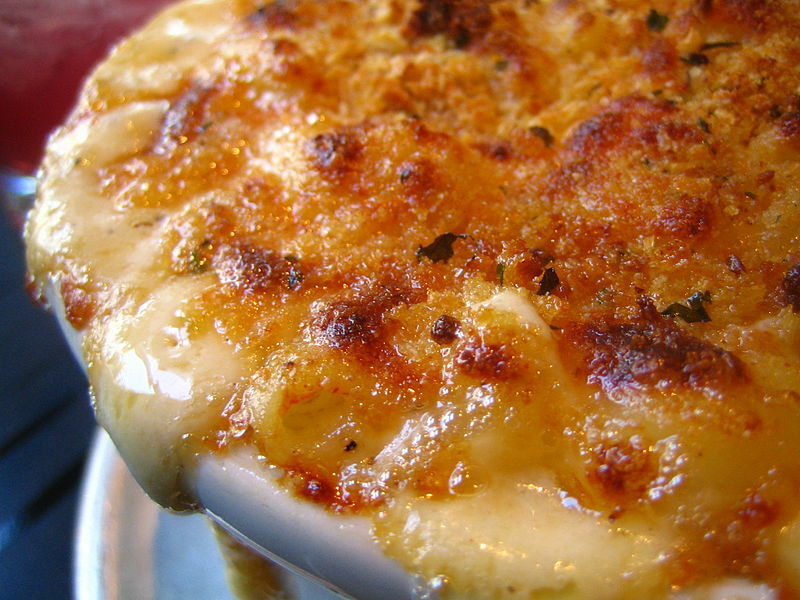 If you’re idea of comfort food is ooey gooey mac and cheese, here’s a great wine. One of my favorites hails from California and is the J. Lohr Chardonnay. At around $20, here’s another great wine you can enjoy any night of the week. Aromas of nectarine, pear and apples greet you and will bring back memories of Mom’s apple pie. Gorgeous buttery smooth with a hint of vanilla toastiness from the oak barrels, and you’ll find yourself cooking comfort food more often. There’s no way I can write a food and wine blog without mentioning my favorite comfort food – pasta. 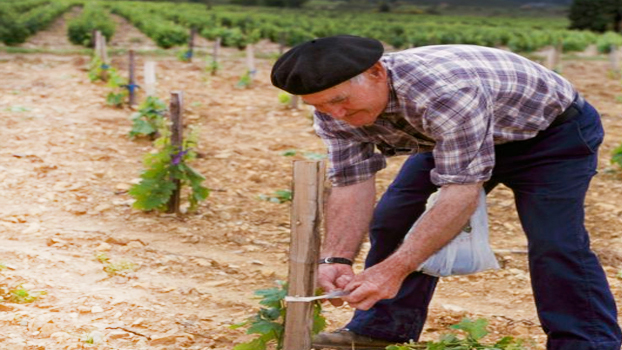 And probably my favorite wine varietal – Old Vine Zinfandels. The St. Francis Old Vine Zinfandel is a flavorful beauty but be careful, it packs a punch with 15.7% alcohol. Believe it or not, the alcohol doesn’t over-power the wine – but if you’re a cheap drunk, you may want to be extra careful with this one. For every 3 bottles of wine opened in the United States, 2 of them come from California. And for good reason – they make great wine. This one is zest and balanced and full of spicy cherry flavors. Zinfandel is very food friendly so it will go with pretty well anything. And if you don’t like the thought of that much alcohol in your wine, try one of these Old Vine Zinfandels. They will be a welcome addition to any dinner table and they are all delicious. I have a confession to make. The response to my last 2 blogs have been so overwhelming, that I actually got writer’s block thinking about it. I want to thank everyone for reading and sharing my blog, I am very appreciative and very humbled that you would take the time out of your busy lives to spend a few minutes with me and my thoughts on wine. A very big thank you to my good friend and colleague in Radio, Anthony, who helped me with this bout of writer’s block. Anthony is a genius in the Production room, and he too, learns something about wine every day. So I went to him and he came up with the topic of today’s blog. I would like to welcome all my new Twitter followers from the United States and abroad over the past few weeks, and all my friends here in Canada as well. I love having you as part of my journey to become a Sommelier. Next week is Thanksgiving here in Canada, and next week’s blog is dedicated to all of you. 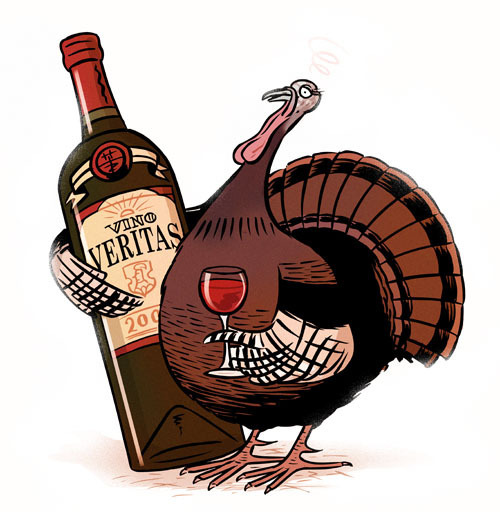 I will be giving thanks to great friends, great wine and great times together.